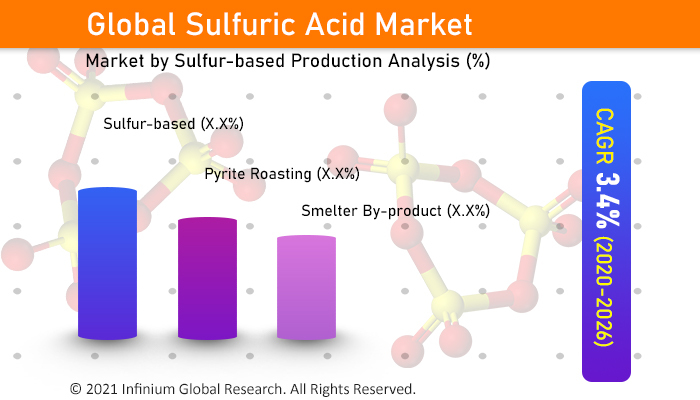 A recent report published by Infinium Global Research on the sulfuric acid market provides an in-depth analysis of segments and sub-segments in global as well as regional sulfuric acid market. The study also highlights the impact of drivers, restraints and macro indicators on the global and regional sulfuric acid market over the short term as well as long term. The report is a comprehensive presentation of trends, forecast and dollar values of global sulfuric acid market. According to the report the global sulfuric acid market is projected to grow at a CAGR of 2.7% over the forecast period of 2018-2024. Sulfuric acid plays an import role in the chemical industry. Sulfuric acid used as a base acid to form numerous compounds including sulfate salts, pigments and so on. Sulfuric acid is a mineral acid that is colorless and odorless in nature. The sulfuric acid is made from the chemical reaction of water with the sulfuric oxide by using a various process such as contact process, wet sulfuric acid process and so on. The Sulfuric acid absorbs water vapors present in the surrounding environment as it has Hygroscope phenomenon. Sulfuric acid is very acidic in nature so the contact of sulfuric acid is very harmful to the skin even if it is in concentrated form. The demand for sulfuric based fertilizers is the primary factor driving the growth of the sulfuric acid market worldwide. Sulfuric acid has a great product portfolio as compared to other chemicals in the world. In addition, increasing use of sulfuric acid in the oil & gas industry as well as in water treatment is contributing to the market growth over the forecast period. However, in various countries, the government is not favorable for the use of sulfuric acid as it is very dangers in nature. The factors such as unfavorable government policies and the high prices of the raw material act as a restraint for the market growth of sulfuric acid. Moreover, the rising use of sulfuric acid in the various application is projected to create various opportunities in the upcoming years. Among the applications, the fertilizers segment accounts for almost 49% of the market share in the total market. The demand of Phosphate Fertilizers is rising to very promptly in the world market as the production of nutrient-rich food crop is increasing. Geographically, the Asia-Pacific has the highest market share in the sulfuric acid market. Countries like China and Japan are the major countries contributing to the growth of the sulfuric acid market in the Asia-Pacific region. The presence of various flourishing chemical industries and the availability of raw materials are the factors boosting the market growth of sulfuric acid in the Asia-Pacific region. The report on the global sulfuric acid market covers segments such as, grades and applications. On the basis of grades the global sulfuric acid market is categorized into 10%, 29–32%, 62–70%, 78–80% and 98%. On the basis of applications, the global sulfuric acid market is categorized into fertilizers, metal processing, phosphates, fibres, hydrofluoric acid, paints and pigments, pulp and paper and others. The report provides regional analysis covering geographies such as North America, Europe, Asia-Pacific, and Rest of the World. In this section, the key trends and market size for each geography is provided over the period of 2016-2024. The countries covered in the North America region include the U.S., Canada, and Mexico; while Asia-Pacific includes China, Japan, India, South Korea, Malaysia, and among others. Moreover, Germany, U.K., France, Spain, and Rest of Europe are included in the European region. The U.S. drives the growth in the North America region as it is the largest market in the region. The Asia-Pacific region offers a substantial potential for the market growth owing to rapid growth in markets such as India and China. The APAC region is projected to experience a growth at a CAGR of x.x% over the period of 2018-2024. The report provides profiles of the companies in the global sulfuric acid market such as, BASF SE, DuPont, AkzoNobel N.V, Agrium, Vale Fertilizantes S/A, Evonik Industries, Chevron and Solvay, Bayer, Praxair, Inc. and Khaitan Chemicals & Fertilizers Limited. The report provides deep insights on demand forecasts, market trends and micro and macro indicators. In addition, this report provides insights on the factors that are driving and restraining the global sulfuric acid market. Moreover, IGR-Growth Matrix analysis given in the report brings an insight on the investment areas that existing or new market players can consider. The report provides insights into the market using analytical tools such as Porter's five forces analysis and DRO analysis of the sulfuric acid market. Moreover, the study highlights current market trends and provides forecast from 2018-2024. We also have highlighted future trends in the sulfuric acid market that will impact the demand during the forecast period. Moreover, the competitive analysis given in each regional market brings an insight on the market share of the leading players. This report will help manufacturers, suppliers and distributors of the sulfuric acid market to understand the present and future trends in this market and formulate their strategies accordingly.